This year’s Easter Gift Guide offers more than just a basketful of candy for your “some-bunny” special! My Snuggle Bunny Gift Set: An adorable snuggle bunny counts 10 ways that it loves your child, in this beautifully illustrated storybook. Includes the book plus a cuddly plush bunny for the child to snuggle with! Jesus Sees Us: Faith Based Jesus Doll and Book: Jesus Sees Us is a beautifully relatable tool for introducing Faith, Jesus and His teachings into your child's life. The Jesus Sees Us doll and accompanying book are tools to assist you in engaging your child and starting the conversation with them about Jesus' teachings. Jones Soda: Limited Edition Flavors: Celebrate Easter and the return of Fan Favorite flavors, MF Grape and Pineapple Cream, that come in fun packaging featuring chicks and bunnies! Perfect for enjoying the longer days, family parties and even for Easter baskets! This pack includes 3 bottles of each flavor. Organic Jolly Beans: These tiny organic jelly beans are 100% vegetarian, gelatin-free and certified organic. Kids will love the succulent fruit flavors, and they’re made with organic ingredients. Organic Sunny Bears: SunRidge Farms’ Sunny Bears are 100% vegetarian, gelatin-free, and free of artificial flavors and colors. Sunny Bears come in bright, fruit-forward flavors. All Natural Milk Chocolate Rainbow Drops: All natural chocolate candies that are free of both food dye and titanium dioxide. Green as can be, these delicious chocolate candies are colored with vegetable juice, and made with premium milk chocolate, real vanilla and pure cane sugar. Rainbow Drops are non-GMO, free of preservatives, hydrogenated oils, artificial ingredients and artificial colorings. They also happen to come in Easter-appropriate pastel hues. Hoppy Paws: Decorate indoor and outdoor surfaces using Hoppy Paws’ stamp kit to create realistic Easter Bunny paw prints in a safe, non-toxic, biodegradable ink. The best part is it washes off using only water- no mess, no fuss. Tropical Paradise ChapStick: Treat your lips to the exotic taste of the islands with the new sweet, refreshing flavors of the new limited-edition Tropical Paradise Collection! This collection features three delicious, fresh fruit flavors: Watermelon Splash, Mango Sunrise and Aloha Coconut. The new Tropical Paradise Collection will be available for a limited time beginning in April. LEVEL Life: Why not fill those Easter baskets with healthy & delicious sweets this year? LEVEL Life’s sweet snacks come in two flavors, Peanut Butter Cups & Peanut Turtle Bars and are made with 80 percent less sugar than traditional offerings. Peanut Turtle Bars have a sweet chocolate flavor poured over classic roasted peanut pieces in this delight that satisfies your sweet tooth and gives a nutritional punch. Peanut Butter Cups combines peanut butter and chocolate in the perfect balance of salty and sweet with no compromise on the classic peanut butter cup taste you crave. Veggietales: A Very Veggie Easter Collection: The perfect gift for Easter, the Very Veggie Easter Collection contains our popular Easter DVDs "Twas the Night Before Easter" and "An Easter Carol." Also, this set includes 2 of our most popular CDs - "A Very Veggie Easter" and "Hosanna!" DOVE Chocolate Covered Fruit: Real Fruit Dipped in DOVE Dark Chocolate is the perfect combination - Real Fruit and America's #1 DOVE Dark Chocolate! This new item comes in three varieties of real fruit - cranberry, cherry and blueberry. Put the health and wellness benefits of dark chocolate back in your basket this Easter. Celebrate the start of spring with fun and iconic PEEPS® that will make any Easter basket complete. PEEPS® can serve as Easter basket essentials, colorful additions to baked goods and adorable accents to art projects and decorations … or delicious, sweet treats. Try one or all of the seasonal varieties or the NEW PEEPS® Decorated Eggs and express your PEEPSONALITY®! Happy Easter Decorated Oreo Tin: Ring in Spring with this brightly colored tin filled with 16 festively decorated Oreo® cookies enrobed in rich Belgian white, dark or milk chocolate. 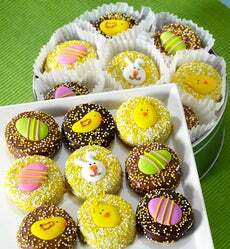 They’re decorated with yellow and white non-pareils and each feature a unique Spring design including an incredibly cute bunny, a sweet little chick, and a colorful egg — all are scrumptious. Send your own personal message inside the tin. The Rise & Shine Springtime Peruvian Lily Plant is a cheerful way to send your warmest wishes to friends, family and loved ones! A simply stunning Peruvian Lily Plant, also known as alstroemeria, arrives blooming with sunlit yellow flowers amongst lush green foliage to create the perfect spring display. Presented in a deep coral basket with a natural roping embellishment at the top, this gorgeous blooming plant will make an excellent Easter, Mother's Day, birthday or thank you gift. Hop (Blu-ray + DVD + Digital HD): When teenage E.B. leaves for Hollywood, who is destined to be the Easter Bunny, in pursuit of his dream to become a rockstar drummer, he meets Fred, an out-of-work slacker with his own lofty goals. Together the two encounter a series of hilarious mishaps and misadventures and in the end help each other recognize the importance of family. It's not to late to have your product featured in the Easter Gift Guide! Last day to submit product is March 31, 2015. Hey Thanks lots of great ideas to make a better Easter baskets. This is quite a list of great Easter gifts! I need to get a couple of those new Chapsticks! !